Hyundai Motorsport hired Norwegian Andreas Mikkelsen to drive for the team in the last three rounds of the 2017 World Rally Championship – RallyRACC Catalunya – Rally de Espana, Wales Rally GB and Rally Australia. 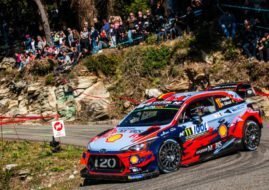 The Korean-German team is targeting Manufacturers’ World Rally Championship title this year and the team decided to do everything it’s possible to catch rivals from M-Sport Ford in the last three rounds of the championship. As Andreas Mikkelsen is currently the hottest free agent on the market, proving his qualities in recent drives with Citroen C3 WRC, Hyundai decided to make changes in its line-up to give a car to Mikkelsen, wanting to score as much as possible points in the last three WRC rounds. Andreas Mikkelsen will drive the Hyundai i20 Coupe WRC in the next month’s Spanish WRC round alongside Thierry Neuville and Dani Sordo, with Hayden Paddon being out for that event. The line-up for gravel events in Great Britain and Australia will be announced later. The most likely is that Sordo will miss those events. After losing his full-time seat when Volkswagen Motorsport left the WRC at the end of 2016, Mikkelsen recorded WRC 2 class wins at Rallye Monte-Carlo and Tour de Corse with Škoda Fabia R5. He then tested with Hyundai in Portugal in April, but he didn’t join the team because the line-up was already fixed. In the meantime, he performed well in three events with Citroen, finishing 8th in Italy, 9th in Poland and 2nd in Germany.